The Right Way to Check References Checking references is a crucial part of the supplier vetting process. I’m always surprised at how many people fail to ask for them, or take the step to request references, but then don’t follow up and call! This an omission you can’t afford to make when deciding to work with a new factory, especially since interviewing references is a free, simple way to learn more about potential partners. Here are 5 tips when requesting references from potential suppliers. 1) Ask for Multiple References, Not Just One A good supplier should have more than one person willing to vouch for them. 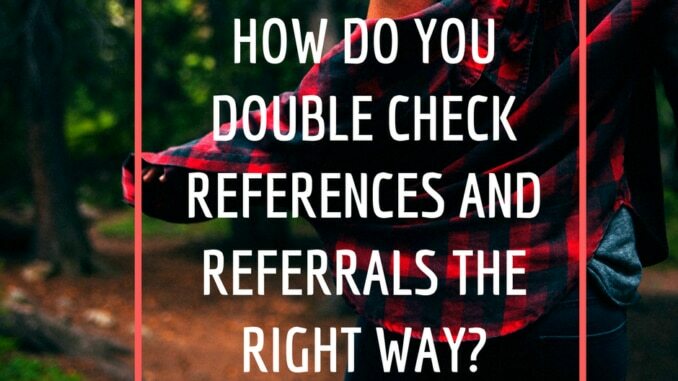 When asking for references, make it clear you’d like to speak with a few people. If they only send you a single reference, ask why this is the case, and politely let the supplier know you’d feel more comfortable hearing from multiple sources. If they avoid answering the question and seem unable to come up with alternate references, this may be a sign that another partner is a better fit. 2) Request References in Your Product Category It’s best if you can speak to a past or present client who made a product like yours. For example, if you are launching a line of blazers and interviewing cut and sew factories, ask if they have any references for clients who have also completed orders for blazers. This is not always possible due to privacy concerns, however it’s still a good idea to ask, as you’ll receive insight into how the factory handles a specific product line. 3) Set Up A Phone Call, Not Just an Email Speaking on the phone can give you a more nuanced picture of how the reference feels about the factory. Maybe they provide a solid endorsement, but when you bring up the issue of meeting delivery deadlines, they make a joke about the factory always being late. This is information that you want to know! A phone call is usually more data rich than an email because of the multiple layers of communication (tone, pauses, offhand comments etc). 4) Include the Following Questions First, it’s a good idea to write down your questions in advance so that you don’t forget something important. Everyone will have different questions based on their product type, history, goals etc. but here are some that are universally helpful: “How long have you worked with the factory?” (If it’s a very short amount of time, the answers they provide are only so valuable) “Have you had any quality problems with the factory, and if so, what did they do to remedy the problem?” “Has your pricing changed over time, and if so, why?” “Does the factory consistently meet the deadlines that you set together? If not, why?” 5) Remember to See the Big Picture Not all the information you receive from a reference is a yes/no data point in terms of deciding to work with a factory or not. Let’s go back to the previously mentioned comment about the factory sometimes being late. You may still decide to move forward with this partner, despite the report of delays. After all, no business is perfect and sometimes things come up. The important thing is that you are now informed so that you can prepare for the relationship in the best way possible. If you know the factory you’ve selected occasionally runs behind schedule, you may build extra time into your production calendar, never over-promise dates to your customers, and make a habit of checking in with the factory regularly so that are you never in the dark about changing timelines. These are all things that will make your business run more smoothly. 3 Mistakes People Make When Paying Suppliers Sending a supplier money can be scary. Did you choose the best partner? Will they really deliver what you asked them to? How do you know you can trust them? Unfortunately – and I wish I didn’t have to say this – some of this fear is warranted. As someone who helps product entrepreneurs find factories daily, I’ve seen my share of wasted investments and relationships gone awry. What I’ve also noticed is that many “makers” make the same mistakes when it comes to paying suppliers. When doing a “post-mortem” on what went wrong, the brand and I almost always uncover one of the following three errors. 1) Lack of thorough vetting Did you ask for referrals *and call* those referrals? Did you ask them the right questions? Did you look for reviews and any complaints with the Better Business Bureau? Did you confirm (through a client list or reviewing samples) that the factory has experience in your category? A recent client ordering slipper agreed to work with a supplier who said “no problem, we can make those” after reviewing the photo they provided. The client proceeded to send several thousand dollars for the development and sampling of these slippers, only to find out the factory has not made a similar style and was learning as they went (which translates into sub-par samples and a lot of wasted time). Vetting can be quite a bit of work, especially if you are exploring multiple suppliers. It’s a great idea to make a checklist of to-do’s and questions for each potential so that you don’t miss anything. 2) Moving forward without a contract or clear list of deliverables Things can obviously get messy if you haven’t spelled out exactly what will get done and by what date. This is equally helpful for the supplier as it is the client, because schedules are often delayed when brands take longer than anticipated to provide instructions and feedback. Adding contingency clauses (ex: If X is not completed by Y date, we will do Z), either in a formal contract or as part of the written communication between you and a supplier will help prevent disagreements. Taking this step would have helped another recent client who spent $10, 000 in design fees with a firm to have samples for an upcoming trade show (that they had paid a significant amount of money to attend). The factory was constantly behind the eight ball, resulting in the client missing the show and losing their entire booth payment. If it’s so important, why doesn’t everyone have a formal contract? Because some suppliers don’t issue them, and they can be expensive for brands to create with a lawyer. As a rule of thumb, I suggest investing in a contract if your purchase order is large enough that you would be unable to continue with your business if things go wrong. 3) Paying 100% up front Don’t ever do this! There will be a few exceptions where things sometimes require full payment, such as a mild fee for a metal or plastic component of your product. These are unavoidable. But when it comes to services like product or garment development, sampling, and production, it’s best to pay a deposit to get started and then the balance once you’re satisfied with the final product. This will sometimes require visiting a factory in person since they may ask for the balance payment prior to releasing your goods. Another way to structure relationships with service providers (like designers and engineers) is to pay for the work in stages, as it’s completed. This allows you to start small and essentially “test” a new partner before committing to the whole job, and they also protect their time and energy since they’re not doing work they haven’t been paid for. When you pay for a service in full, you lose your most compelling negotiating tool – a refusal to send more money until the company corrects unsatisfactory work. You also lessen your financial exposure should they fail to deliver entirely, which happened to a wearables brand who hired an engineer to create some technical drawing for them. The engineer started the project, sent incomplete files, and then stopped responding to communications. While it’s a shame to lose a 30% deposit payment (as they did) it’s even worse to lose 100%. Something important to note: payment terms will evolve as you develop long-term relationships with suppliers. When both you and your partner trust each other and have successfully completed projects together, it’s natural for both sides to be more flexible with their requests.